After Doyle killed off Sherlock Holmes at Reichenbach Falls, the outpouring anger from fans led him to write a novel of before the fall, The Hound of the Baskervilles. But fans were still upset and Doyle was in debt, so he resurrected Holmes in “The Adventure of the Empty House,” explaining that Holmes faked his death and traveled as a Norwegian named Sigerson. 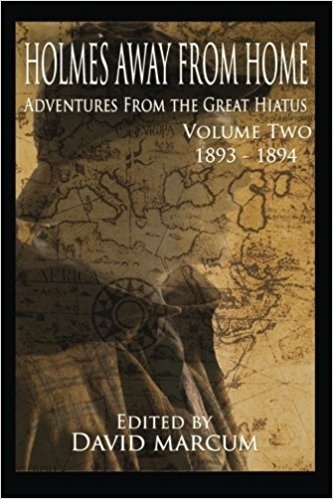 The period of time that Holmes spent wandering Tibet, Persia, and even the United States became known as the Great Hiatus. These are the second volume of stories from that time period. In reading these stories, one stood out for me as “Best in Book.” This is Robert Perret’s “A Case of Juris Imprudence,” which is the fifth story in the volume. Holmes is in the States as Mr. Samuel Baker. He is contacted by Detective “Gus” Shea. Shea has unease about a young woman in prison for the axe murders of her father and stepmother. Sound familiar? He isn’t sure the girl, Lisa Billings, is actually guilty because they cannot find her parents heads, yet she never left the property. This story was absolutely brilliant! Encore! This volume had great stories from start to finish, and I am finding difficulty finding one that I like the least. We’ll just skip “last place” and go straight into the stories. The book opens with David Marcum’s “The Adventure of the Old Brownstone.” Kudos for tying together Holmes, Solar Pons, and Nero Wolfe! “The Adventure of the Flaked Breakfast Cereal” by Mark Levy focuses on the bad blood between cereal giants Dr. John Harvey Kellogg and CW Post, also bringing into play Reverend Sylvester Graham, creator of Graham Crackers! Nice! “For Want of a Sword” by Daniel Victor pits Sherlock Holmes and his brother Mycroft in an argument about a case which Watson is to judge! This is great! “The Case of the Fragrant Blackmailer” by SF Bennett finds Holmes aboard ship from Calcutta to Suez. He finds there a female perfume maker who knows his secret and threatens to out him if he doesn’t help her! Holmes blackmailed! Novel idea! “A Most Careful, Strategic, and Logical Mind” by Derrick Belanger relates how Holmes met a hero of the Battle of Gettysburg from the American Civil War. I think I could give you a few more names for the war than you mention, my friend! Nice! “The Aviator’s Murder” by C Edward Davis pits Holmes against a stubborn officer of the law. Holmes needs to set the man on the right track without revealing himself. Close call, this one! “The French Affair” by Mark Mower is perhaps the best rendition of Holmes’ investigation into coal tar derivatives in Montpelier, French I have ever read! Watson references this case in passing in “The Problem of Thor Bridge.” Very well done indeed! “The Woman Returns” by Richard Paolinelli needs little introduction. Irene Adler finds Holmes in France after the case mentioned just above. She has a case of her own that she needs help with… Reuniting Holmes and Adler is a knock-it-out-of-the-park story! “The Adventure of the Melting Man” by Shane Simmions tells the story of “The Empty House” from Wiggins’ perspective. Wiggins has been working for Mycroft in Holmes’ absence. Mycroft goes to Madame Tussauds to obtain a certain bust… The end of the story with Wiggins in the streets is amazing! The book is a treasure I recommend to all Holmes fans young and old! It definitely gets five stars plus!